The village of Grange lies down in the valley with Grange Fell in the centre of the picture. Its geography is complex. 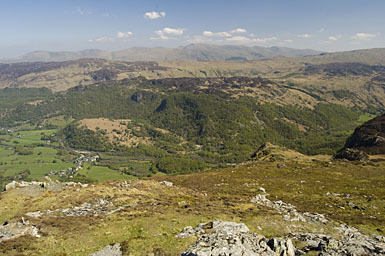 The dark shape of Black Crag is seen full face on the left of it, Greatend Crag, seen from the side, on the left side of a grassy knoll. King's How is the summit just right of that and further right still is Brund Fell the highest of the Grange fells. In the middle distance are, from the left, High Tove, Middle Crag and Shivery Knott with the slope leading up towards Ullscarf off the right of the picture. On the horizon are, Great Dodd, Watson's Dodd, Stybarrow Dodd, Raise, White Side, Catstye Cam, Lower Man, Helvellyn, Nethermost Pike, Dollywagon Pike, Fairfield and Great Rigg. Larger version of this picture.